Unlike home users or beginners,data recovery professionals also encounter data loss challenges, undoubtedly. Some problems are so trivial that user scan resolve them with their knowledge, but some are arduous that users fail to resolve on their own and requires experts’ opinion. At this stage, a good feature-rich software is the best bet for them. If you are a professional user looking forward to a unique data recovery tool to cater your advance needs diligently, then here is a list of 10 best professional data recovery software for you. These utilities are intended for the advanced or business users who have in-depth knowledge about recovery methods, different files systems, hard drive operations, and much more. Read on to understand how these utilities undelete lost or accidentally deleted data needs effortlessly. Very impressive all-in-one data recovery software for high-end users! It is top-rated owing to its smart features such as Deep Scan, turn On/Off files preview, HD-MOV raw recovery support, option to search specific file types in a specific folder/ logical drive. Another excellent recovery software that ensures easy and efficient recovery from MP3 player, digital camera card, and recycle bin along with Windows computer. This dedicated recovery tool has a user-friendly wizard. You can seamlessly recover emails, documents, files, pictures, music, videos, or other lost file types. A safe and efficient all-around data recovery tool. It is considered as an excellent data recovery tool for professionals owing to its improved tool set and impressive features. With this tool, you can smoothly recover lost emails, files, documents, photos, videos, etc. from your internal or external hard drives, USB drives, and removable drives. An impressive tool to undelete lost data and manage the same for long-term.Built-in Hex editor, disk copy module, remarkable documentation, file preview, and support for network data recovery are few of the key attributes that make it stand high among the list of top 10 software tools. Whether you want to recover lost data from partitioning error, raw hard drives, crashed hard disk, Trojan infection, system failure, etc. Recover My Files is another sure shot solution. Using this software, you can efficiently recover emails, business-critical documents, photos, and videos. An extremely easy and efficient data recovery software tool. With its smart feature like “Deep Scan”, this utility tracks down in-depth to search all lost, formatted, hidden, or inaccessible files. The success rate of this utility is quite high. Another plus point is its simple three-step recovery procedure. An undelete program with advanced features, this tool user can easily recover deleted files and partitions. The key distinguishing feature is its ISO image file, which helps create a bootable USB, DVD, or CD for booting an unbootable PC. It also includes a feature to fix volume boot sectors. Like other software, it is another recovery tool to undelete lost or permanently deleted files and folders i.e. lost by hard disk crash, hardware replacement and malfunction, disk formatting, and virus or spyware attacks. A plus point is its advanced algorithms whereby you can easily recover all lost files and folders by thoroughly scanning the damaged partition. Tenorshare Data Recovery with its ability to recover all types of files, make it a great recovery tool for professional users. Regardless of whether the data lost is due to pressing Shift + Delete keys, dead/resized/corrupted partitions, formatted drive, emptying the Recycle Bin, or storage media,etc. this pro-data recovery tool allows you to recover lost files. A must-have tool for the data recovery as well as forensic specialists, it is considered as one of the highly configurable and high-speed data recovery programs. With its smart features such as forensic capability, disk imager, disk editor, and much more, it ensures to cater the undelete process quickly and smoothly. This improved software also ensures recovery from unformatted hard drives. Now, selecting the best data recovery tool is no more a tedious task. With these a fore mentioned top performing data recovery software, you can easily choose the efficient undelete program that exactly matches the needs of the professional users. 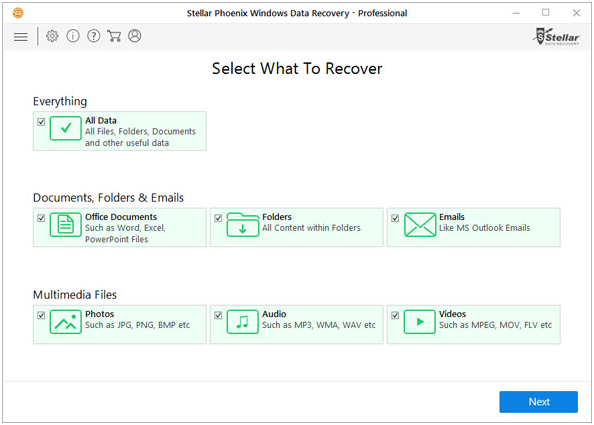 Out of these mentioned software tools, the Stellar Phoenix Windows Data Recovery – Professional is the highly recommended software owing to its smart options like effective search, advanced settings, multiple DPIs support, Power scan engine, and much more.